Q1. Which two characters on the original Charlie's Angels television series appeared in all 110 episodes (including the pilot 1976 made-for-tv movie)? Q2. Which character was represented on almost every episode of the Charlie's Angels 1970's television series, as well as the 2000 and 2003 Charlie's Angels big-screen movies? The "Angels" of Charlie's Angels featured in the above first season trailer were 3 female Los Angeles police academy graduates (characters Kelly, Sabrina and Jill) hired by a millionaire (Charlie Townsend) to work as private investigators. 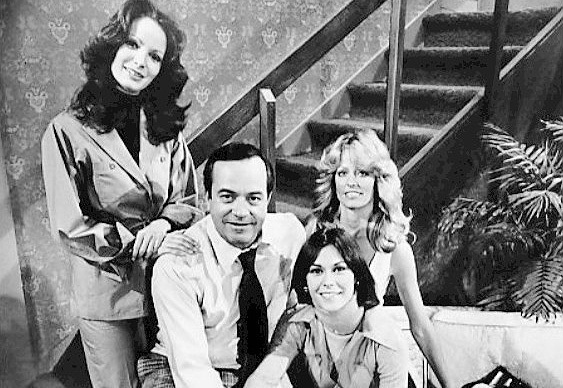 From left below, the Charlie's Angels original cast circa 1977: Jaclyn Smith, David Doyle, Kate Jackson, and Farrah Fawcett. Kate Jackson was the first character cast in the series, by producers Aaron Spelling and Leonard Goldberg. Jackson was originally considered for the role of Kelly Garrett (which ended up being played by Jaclyn Smith), but preferred the character of Sabrina Duncan. Jackson was the most well known of the three actresses at the time casting for Charlie's Angels took place, due to her recent starring role in the popular television police series "The Rookies" (1972-1976) - another favourite baby boomer tv show. She was given some control over the development of the series after being hired, and it was Jackson who decided the 3 female detectives would be called Angels. When Kate Jackson left the series after the third season, actresses Shelly Hack and Tanya Roberts came on board for years 4 and 5 respectively, playing new/replacement angels Tiffany Welles and Julie Rogers (for a year each). Farrah Fawcett-Majors (1947-2009), wife of actor Lee Majors of the extremely popular Six Million Dollar Man television series (1974-1978), was a model and actress. She had appeared in small roles in Lee's show, other television series, and in the movies. Early in 1976, Farrah had a poster released featuring her in a red bathing suit and elaborate waves in her blonde hair. Todays female 50+ baby boomers and seniors instantly know what is meant by the phrase "Farrah" hair; and male baby boomers and seniors will recall the red biniki she wore. The immediate popularity of this poster with baby boomers won Farrah Fawcett a supporting actress role in the movie Logan's Run, which in turn won her the job as angel Jill Munroe in the Charlie's Angels pilot movie. Charlie's Angels was so popular that first year that the 3 original actresses (Jackson, Fawcett-Majors, and Smith) in character as "Angels" appeared on the cover of Time magazine in November 1976. Jaclyn Smith was the only original "angel" that had to audition for the role, beating out hundreds of other actresses to play the character of Kelly Garrett. All three of the original angels were signed to 5 year contracts, which became a problem even before the end of the first season for Fawcett-Majors, who wanted to be released from the show so she could act in movies. After some wrangling with ABC, Jaclyn Smith agreed to guest star in 6 episodes between 1978-80, in exchange for leaving the show 4 years early. On the show, her character's younger sister Kris Munroe (played by Cheryl Ladd) filled Jill's place as an angel. A1. Angel Kelly Garrett (played by Jaclyn Smith) and John "Bosley" (played by David Doyle) were the only two characters to appear in all 110 episodes, which included the pilot made-for-tv movie. A2. John Forsythe, who voiced the character of Angel's boss and millionaire "Charlie" Townsend, never appeared in front of the camera on the television series, and his name did not appear in the credits for the show. Forsythe also voiced the character of Charlie in the movies - 2000's Charlie's Angels and again in 2003 in Charlie's Angels: Full Throttle.